Karpuramanjari: Who is Hedging Whom? The very word ‘risk’ evokes different meanings for different people. 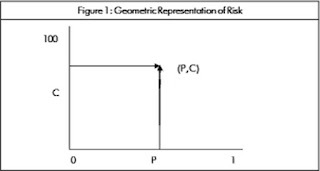 It is perhaps to prove this point that risk has many variants of its definition: Possibility of loss or injury; peril; a dangerous element or factor; a chance of loss or the perils and the degree of probability of such loss; a chance of injury, damage or loss; the possibility of suffering harm or loss; danger; hazards; a factor, element or course involving uncertain danger; the danger or probability of loss. The basic concept of risk is very simple: In financial terms, it is the potential change in the price of an asset or commodity. Risk denotes both the upside and downside of the price movement. But, we rarely consider the upside movement as risk. In routine life we always use risk to denote the most “undesirable” and that is the “loss”. And this commonsense dictum gets vindicated when we say that people are naturally risk averters, which only means that people are in for gains but not for losses. This simply means that risk is always used in a negative connotation. Risk always rests in the future. It is there in everything we do. It is all pervasive and has a profound impact on mankind. Certain risks are known to have only downside but no chance of gain. On the other hand, certain risks are diversifiable while certain others are not. But none of them are said to be extinguishable; at best they can be transferred. Risk retains its fullness, no matter who transfers to whom, who buys from whom or how much of it is bought or sold, until at least it extinguishes on its own. Risk is dynamic. It is an abstract parameter requiring a degree of intellect to measure it. Yet, it cannot be measured directly. It can only be calibrated for it is not a naturally occurring phenomenon. It requires the integration of at least two quantities viz—the chance and the type of event. It is also said that risk cannot be forecasted precisely for it is dynamic. To better appreciate its dynamic nature, let us represent the probability and consequence of risk, which is a direct function of these two factors, as coordinate axes in a common x-y plot configuration. In mathematical terms, these variablesprobability (P) and consequence (C) and the subsequent risk value can be represented by a point in a two-dimensional Euclidean coordinate system. Every ordered pair of probability value and its corresponding consequence value, (P,C) represents one and only one point in this system (Figure 1). 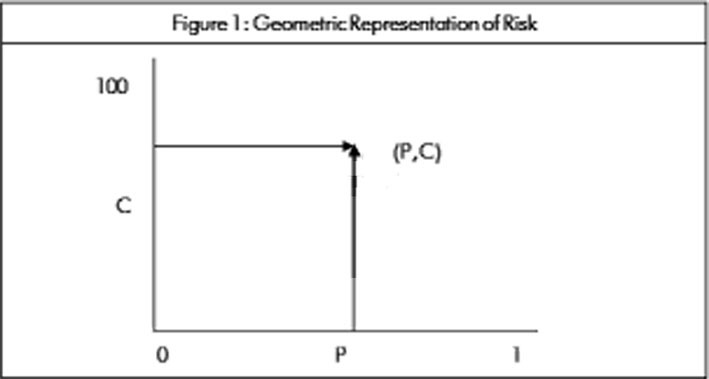 Risk being a relative measure, it matters less where an investor or an organization starts in the risk coordinate system than how its risk changes over time and in what specific direction the risk values move within the coordinate system (Figure 2). 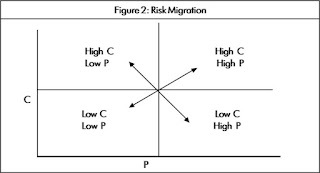 In view of its dynamic nature, risk would acquire a different dimension on a long-term scale. 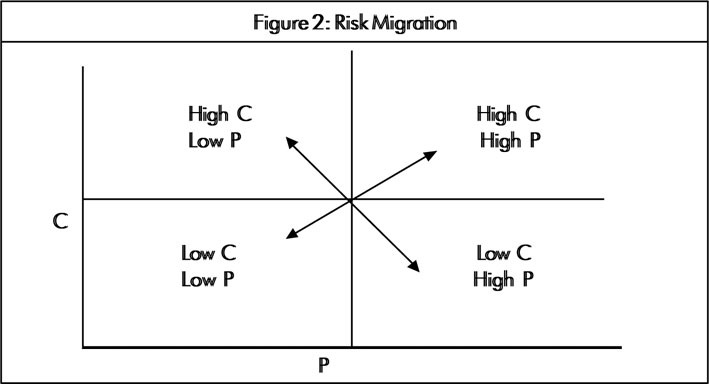 Risk is also not straightforward for there is another dimension to it: The risk of ‘opportunity losses’. This very complexity and dynamism of all pervasive risk has perhaps made life more interesting to live by eternally challenging one’s ability to fight it out, endurance to withstand it and ingenuity to circumvent it. Risk analysis is said to be natural and an innate characteristic of human nature. True, everyday, we use information to reduce our risks of perceived hazards by altering our style of living such as regulating our eating habits, avoiding smoking, using smoke alarms and so on for the purpose of reducing our risk of injury, disease or death. It is amazing how people take the best possible decisions to deal with this kind of inescapable trade-offs in life. They are perhaps well ingrained with the concept of giving off something in return for more of something that they most cherish to own. The pursuit of hedging is thus perhaps as old as civilization though it has become a buzzword in the recent past. One reason for the current hedging-mania could be our improved mental faculties and consequently the “know” of more. The more we know, the more evident risk is becoming. Indeed ‘risk’ has become a shuddering word for any one to pronounce in today’s world. It has been our eternal struggle: Men were longing to create an element of ‘certainty’ amidst ‘uncertainty’. One such classic example of man’s craving for certainty is the Bretton Woods system of fixed exchange rates. However, it did not lost long. By 1970 it became increasingly difficult to afford certainty to exchange rates and with the result, Bretton Woods system collapsed paving the way for the ‘uncertainty’ to once again rule the roost. This collapse and its aftermath have only intensified men’s search for ‘certainty’ in the currency markets. This resulted in the emergence of derivatives followed by other innovations and stock features as tools to fight out ‘uncertainty’. During the last three decades they have grown as effective risk management tools. It is said that by using derivatives, companies or institutional investors can manage effectively their portfolios of assets and liabilities. But ironically, during the course of usage, the very derivatives that have taken birth as saviors of investors have turned out to be very risky and highly leveraged instruments. This reminds us of the proneness of men to certain systematic flaws of which the most prominent being the simple overconfidence about our ability to infer, estimate, and predict the character of unknown events. In financial terms, hedging is said to basically aim at reducing the variability of the corporate income/portfolio income. Another reason why companies or investors go for hedging their exposure to financial price risk is to improve or maintain their competitiveness in the market/portfolio value intact. To better appreciate this mechanism let us take a deeper look at trading on individual stock derivatives: Assume that the current portfolio of Ram consists ACC stock whose price he expects to fall sharply in the near future. To hedge from this fall in price and the consequent loss, assume Ram sold individual stock futures contract of NSE on ACC at Rs. 162, expiry date being March 26, 2003 under the assumption that any fall in the price and the consequent erosion in the value of ACC stock that he is currently holding will be off-set by the gain he will make under the futures contract on ACC that he sold. Now, Ram having achieved the objective of keeping his portfolio intact by going short on individual stock derivatives, labels his purchase of futures contract as an act of hedging. But Ram’s example posits quite a few disturbing questions, such as: When Ram anticipates a fall in ACC price, why he has not opted for the outright sale of ACC stock ? Or is he not quite sure of his view? Is selling of futures contract then, a speculative move? Another most important question here is, what prompted Ram’s buyer of the futures contract, to buy it? Is he speculating that the price of ACC will rise? If so, what is he trying to hedge—his future acquisition of ACC stock? Remember, all these questions merit examination in the context of what we have seen earlier: No business wants to suffer losses and so only goes for hedging. Yet another question: Why Ram has not gone for a put option on ACC? Why only futures contract? Is it because he has to shell down premium upfront, if he had gone for option contract on ACC? In fact, if one watches the volume statistics pertaining to derivatives trading on Indian bourses one gets wonder struck as to why there is a big difference in the trading volumes under futures on index and individual stocks and within individual stocks between futures and options? All this begets the next logical question: Is it a speculative move? There is always a thin demarcation between speculation and hedging. In fact speculation is often disguised as a trading for hedging for after all speculation is nothing but a bet on the future direction of price movements. Of course, it combines high risks with high potential rewards and thus the urge for speculation. And what speculation also needs is conviction of one’s view of the price movement and lots of guts to spare and lose money, no matter borrowed or own. We are back to where we started off—who is hedging whom? And it is certainly pretty fuzzy! Or, is it that risk being in the mind of the perceiver as “beauty is altogether in the eye of the beholder” driving people crazy in different directions. One thing is however certain: Risk is increasingly becoming bad.